The fifth home game at Yankee Stadium after 9.11 was Cal Ripken Day. 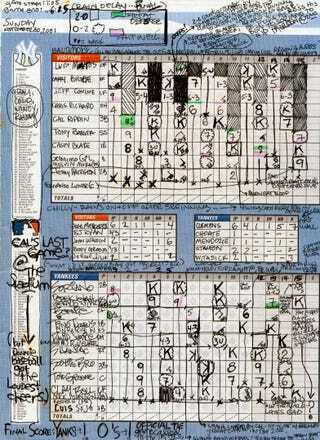 Here's my scorecard. The game ended in a 1-1 tie, called due to rain. It was a cold, miserable day. I remember seeing cops on the roof of the Stadium behind the lights. They looked like prison guards. Ripken gave a short speech before the game, saluted all the famous Yankees, including Jeffrey Maier which prompted boos and laughs. During the National Anthem, the crowd joined in, slowly at first, low but firm. "Oh, say does that..." It gave me the chills. The city was still under the perishable spell of togetherness that existed in the days and weeks after the attacks. During the 7th inning stretch, the field was cleared of everyone but the umps when Eddie Layton played "God Bless America" on the organ. There was more solemn singing from the crowd. It was a memorable day. Cal whiffed 4 times. And nobody won.